you board the night train to Almaty to arrive next day in the early morning. In Almaty not only the cities architecture will be examined but also the Medeo skating complex and a huge dam. The differences between the cities are huge. 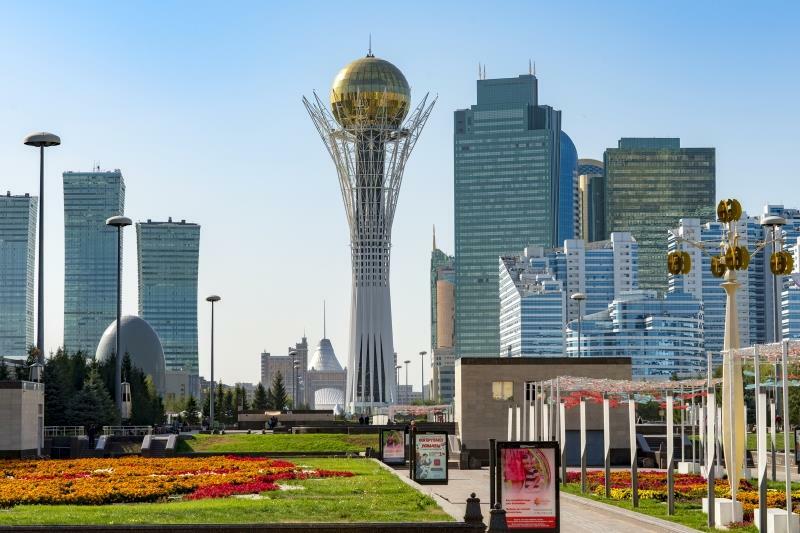 Astana was a provincial town with 50,000 inhabitants until the President in 1995 decided to crown it the new capital of Kazakhstan. In 2019 it has more than half a million inhabitants! Almaty is built from the end of the 19th century and still the largest city in the country. Apart from significant new development in the post-USSR period, it still breathes the Soviet atmosphere. After arrival in Astana and accommodation in a hotel you will get acquainted with the city. Astana, before called Tselinograd and the center of Chrutsjows “Virgin Lands Campaign”, has been the capital of Kazakhstan since 1997. That new status, and the moving of the political elite from Almaty to Astana, has since then led to an increase of the population from some 50,000 to over 550,000 within 15 years! The city simply acts like a magnet for the unemployed from villages and towns in the neighbourhood, and building on a grand scale is still taking place. On the right bank of the river Yesil, which cuts the city in two, one can still find the old-styled houses and buildings. It is however on the left bank that the miracle of Astana is taking place. 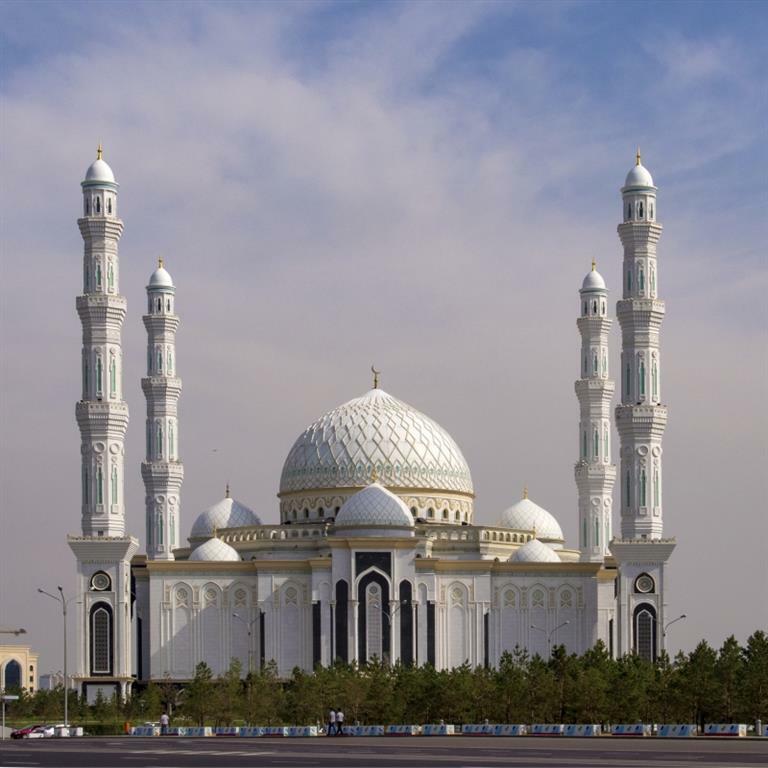 Today you visit and learn about the residence of President Nazarbaev called “Ak-Orda”, the building “Triumph of Astana”, the “Palace for Peace and Unity” – built after a design of Norman Foster – and the mosque “Nur-Astana”. After breakfast you will continue your exploration of Astana. The first visit is to the open air museum “Atameken”, where on 1.7 hectares many architectural and other Kazakhstani showpieces are built in miniature. 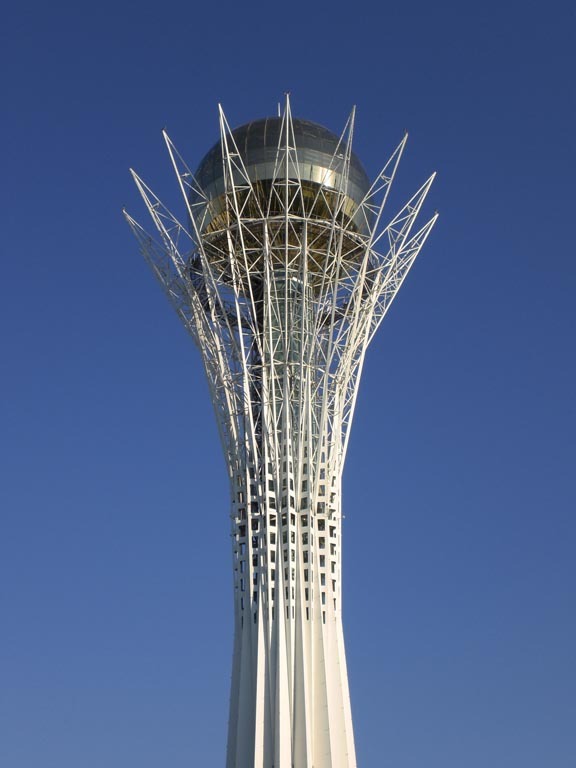 On to the tower “Astana-Baiterek” along a watergreen boulevard, which translates indeed into “tree of life”. 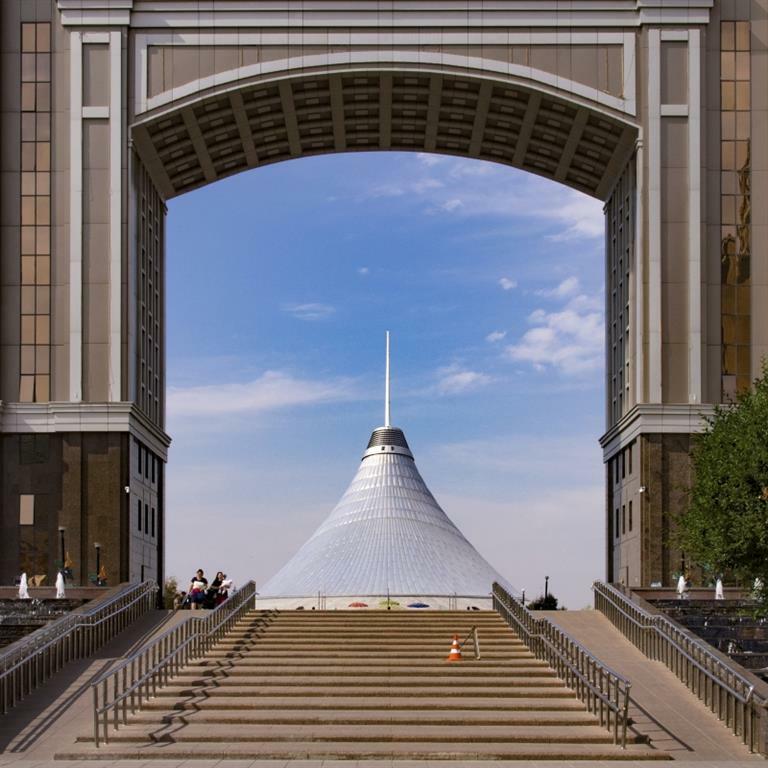 You continue to another Astana masterpiece, the relaxation center “Khan Shatyr”, or “new city under a roof”. After these excursions it’s time for a transfer to Almaty. 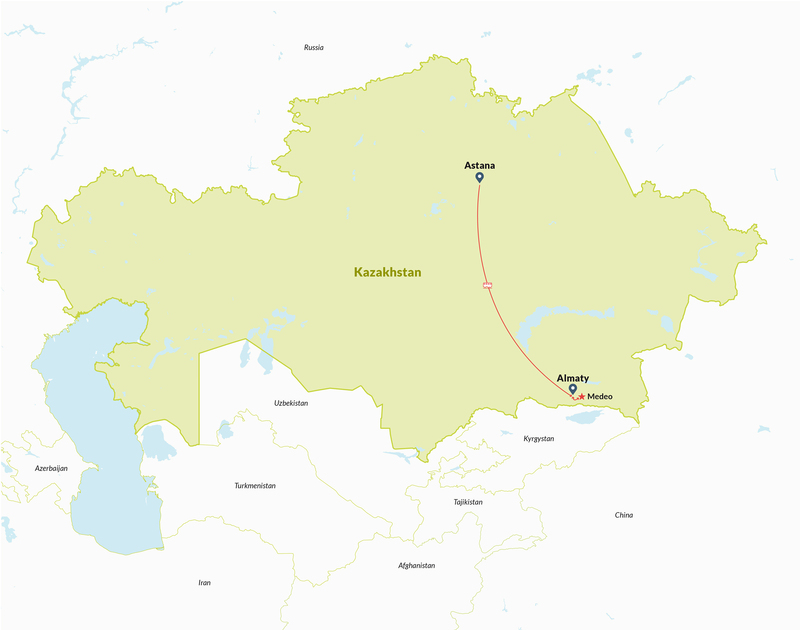 You may choose to take a flight, or alternatively board the luxuruous (Spanish) fast train that leaves Astana at 19:10 and arrive almost 1,000 kms further south in Almaty at 08:00 the next day. 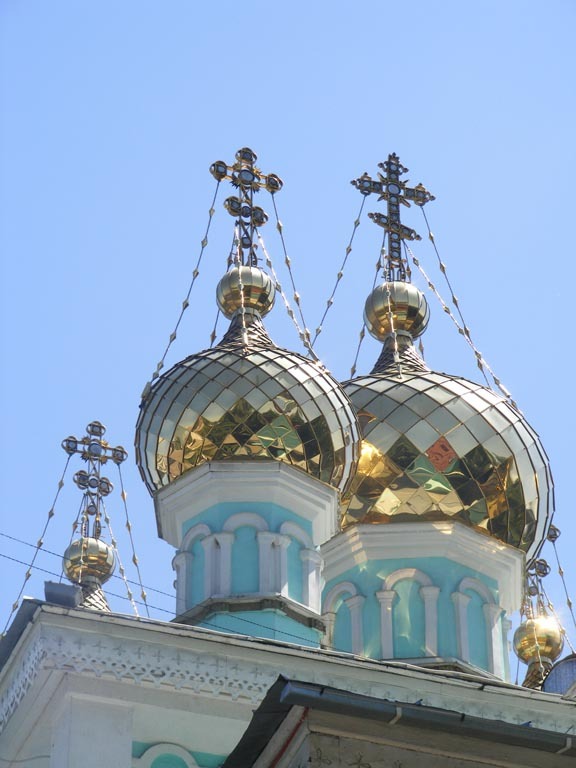 After being accommodated in your hotel, you will continue your architectural tour with a city excursion in Almaty. Until 1997 this was the capital of Kazakhstan, and to this day it is by far the largest city with some two million inhabitants, as well as the economic and cultural center. In Almaty you will find the typical Soviet styled houses and buildings, so familar from Riga to Vladivostok. The city is spacious, green and offers a wonderful view of the snow-capped mountains of the nearby Northern Tien Shan Mountain Range. It’s a pleasure to stroll through Almaty. You will visit the Panfilov Park, where stands the Zenkov Cathedrale, designed by the building master Zenkov from St. Petersburg. Built without any nails it nevertheless withstood a strong earthquake in 1911! In the park you will also find a huge monument to the Victory over the Nazis in 1945. Situated some 20 kms from Almaty, at an altitude of 1,700 meter, is the world famous ice-skating rank Medeo, where more than 120 speed skating world records were established or broken! Surrounded by the high mountains it makes a wonderful picture. A huge nearby dam must protect Almaty from mudslides. 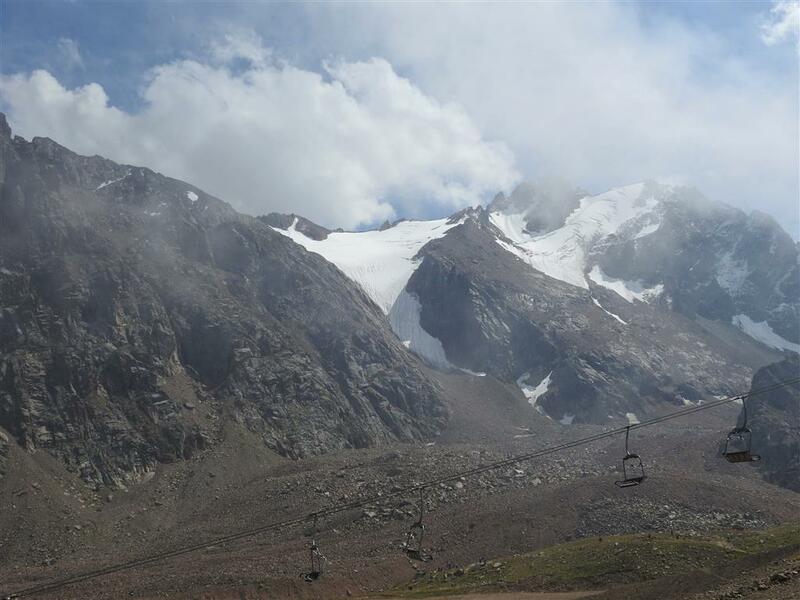 By means of a gondola, operated since January 2011, you can reach from Medeo the ski-resort Chimbulaq at 2,200 meter, from where ski-lifts can bring you to an altitude of 3,100 meters with a wonderful panorama and opportunities for hiking. In the early morning, when most international flights leave Almaty, you will be transfered to the airport. The cost of this program at six persons is €625 p.p., at four persons €685 p.p. and at two persons €795 p.p. For other group sizes please write us for an offer. Not included in the offer are the international flight tickets, lunches and dinners and all not mentioned services. 6 days incl. the international flights.